Cookie with Barry Franks from Petstown, owner April Reeves, family friend Keira Wright (aged 9) and April’s sons (L-R) Dexter, Oliver and Morgan Shuttleworth. The first ever Melksham News ‘Cutest Pet’ competition has been won by Cookie, a two-year-old Cavalier King Charles spaniel dog; and with the title in the bag, Cookie is soon to face another big test – being the ring bearer at her owners’ wedding! Hundreds of votes were received in the special competition organised to celebrate National Pet Month, which aims to raise awareness of responsible pet ownership and encourage fundraising for the nation’s needy pets. 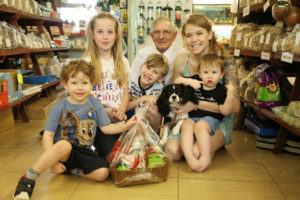 112 pets in Melksham battled it out to be crowned the ‘cutest’ but it was Cookie, owned by couple April Reeves and Chris Shuttleworth and their three sons, Oliver (aged 7), Dexter (aged 3) and Morgan (aged 1), who stole the hearts of Melksham News readers with her big brown eyes and floppy ears. “I am shocked that she won,” said April. “She is my baby girl and I am biased, but I did not expect to win. I was so surprised to get the phonecall with the news. Thank you to everyone who voted! “Cookie is such a loving dog and follows me everywhere and is always underneath my feet. She has grown up with the kids and they are mad with her, she puts up with so much, especially from Morgan the youngest. For winning, Cookie and her owners were presented with a special pet hamper kindly donated by Petstown. Owner of Petstown Barry Franks said, “There has been an excellent response to this competition, we at Petstown have really enjoyed being involved. The Melksham community have certainly proved themselves to be a town of pet lovers!